It was designed as an intimate evening with the Man in Chair breaking the fourth wall and conveying his love of musicals, particularly those from the jazz age, to the audience that, essentially, was sitting in his living room. And despite the cavernous theatres that hosted The Drowsy Chaperone in New York and on the road, the conceit worked and the show garnered a hefty share of awards (5 Tonys and 7 Drama Desk awards). But as slick and genuinely funny as these productions were, none of them created the type of intimacy experienced with the current production running at Boulder's Dinner Theatre. Brian Norber is not only congenial and quirky as the Man in Chair, he genuinely connects with those sitting at the tables nearby, drawing in the rest of us, who aren't much more than thirty feet or so removed from the stage. If you want to be thoroughly entertained while being educated on the nuances of vaudeville acts that populate this show, or the way in which the A and B plots are set up, Brian as the Man in Chair is the guy you want explaining all this, because there's no doubt that this is what he enjoys most in all the world. Any theatre aficionado or newbie will be captivated by these asides, inserted here and there while the stage action is temporarily frozen. And that's just the tip of the iceberg, because the rest of the cast and characters are just as compelling. Janet Van De Graaff (Katie Ulrich) is a Broadway star that can do it all—dancing, singing, acting, and acrobatics—all of which she is willing to give up for the man she loves, Robert Martin (Brian Jackson), a handsome and wealthy hunk she's just met and for whom she's fallen head over heals. Ulrich fits the bill, singing and dancing up a storm, with a personality to match, and the tall, dark, and handsome Jackson—a pleasing tenor, to boot—is a completely plausible excuse for her to give it all up. 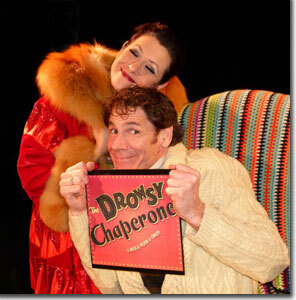 The Drowsy Chaperone (Alicia Dunfee) is charged with keeping the bride and groom separated until the wedding. Between her penchant for champagne and her longing for some romance of her own, she is distracted from her task, which leads to the conflicts that threaten the wedding. Dunfee's larger-than-life charm and outsized personality are a hoot. 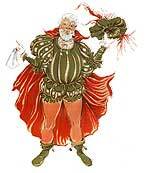 When added to the equally egocentric and eccentric antics of Aldolpho (Seth Caikowski) the results absolutely hilarious. 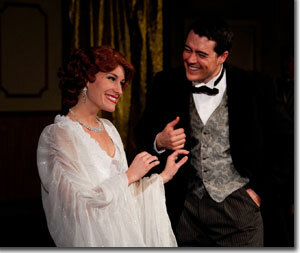 The antagonist is Feldzieg (Scott Beyette), an obvious reference to Florenz Zeigfield, the famous Broadway impresario, who will lose money if Janet leaves the show to become a housewife. Beyette is polished as the straight man to both the thugs Michael J. Duran and Wayne Kennedy), who remind him of the consequences of undermining their "client's" (mafioso) investment, and to his girlfriend, Kitty (Joanie Brousseau), who has been trying to get him to propose. Duran and Kennedy, in a series of fun costumes from Linda Morken, play off of each other to such marvelous effect that you wonder if they didn't work together on the Orpheum Circuit in a previous life. 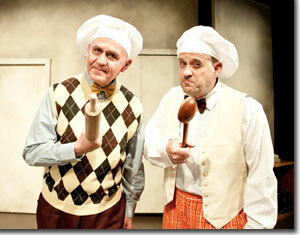 Brousseau, replete with Bronx dialect and clueless expressions, does a great Gracie Allen/Judy Holliday send-up. Another fun Vaudeville routine niftily inserted into the plot is the slapstick "water or vodka" act of Mrs. Tottendale (Cindy Lawrence) and Underling (Bob Hoppe), all of which drives George (Matthew D. Peter) bonkers, as he tries to keep the nuptials on track. The score (and its lively performance by the house orchestra) is so delightful, it makes you wonder if this wasn't an actual show from that era. 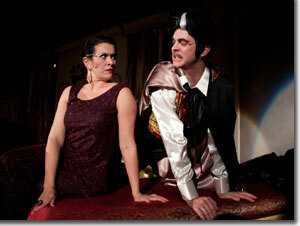 Boulder's Dinner Theatre's production of The Drowsy Chaperone runs through May 13th, 2012. Call 303-449-6000 for tickets.